Bravely Default: Flying Fairy — shortened to Bravely Default in the West — has been a commercial success for Square Enix in its homeland. That's likely contributed to its localisation (along with support from Nintendo) in its follow-up and improved form that's known as Bravely Default: For The Sequel in Japan. As that title makes clear, the developers tweaked and re-balanced the original release with changes likely to be part of the next title — this is evidently a franchise that will grow. Although inevitable, it's comforting that this sequel has now been confirmed for the 3DS in Jump magazine. Nintendo's portable appears to be the only system listed to date, though no release date has been provided. European gamers will have a chance to pick the first game up on Friday 6th December, while North America needs to wait until 7th February 2014. Localisation may not be immediate with the sequel, as was the case with the first, but hopefully success will make it an eventuality. Are you planning to pick up Bravely Default, and are you pleased that a sequel's been officially revealed? Just received mail that my pre order for the first one has been sent. Great news! Twice! That's great to hear! But I still haven't played Bravely Default, cause I have to wait till Feb 7. Happy with a follow up, but already worried they're planning to keep pumping these out until one flops. There's a higher chance of a dev creating a subpar game if they're told they have to squeeze it into an existing universe than if they were allowed complete freedom in terms of plot and mechanics. As a JRPG fan, I approve of this news (even though I won't get to play the original until February... oh, life). Nintendo and Square/Enix haven't really been close since SNES (understandably), but I think with the recent success of SE games on the 3DS, it would be neat if the company decided to start developing a series of "throwback" RPG games exclusively for Wii U. Mid-budget projects that are a return to classic JRPGs like FF6 and Chrono Trigger in style with updated graphics and gameplay. What I'm getting at is that SE should make some steampunk RPGs for Wii U with open world exploration and storybook-like narratives. @Peach64 do you ever have a positive outlook on things? I am still waiting to play the first one. @CaviarMeths They also need to bring Kingdom Hearts HD remixes and Kingdom Hearts 3 to the Wii U. Even though the KH games on Nintendo platforms were on the DS line, it doesn't mean they don't have fans on The Wii U as well. Final Fantasy games should make that trip over, too. I think the Wii U would do a lot better with good franchises like those, and more, even with out EA, Bethesda, etc. Nintendo needs to fill the void made from some 3rd party developers, like EA, Bethesda, etc., with other and, in my opinion, better 3rd party developers, like Platinum Games, Ubisoft, SE, R*, Atlus, Capcom, Activision, Irrational Games, etc. Nintendo should know by now they can't have all the third party support, but they should not try to chase a lost cause like EA. Try with R* or Irrational Games. They could even bankroll some games to minimize risk for more support. Sorry for the bit of a rant, I just don't want to see all of the naysayers being proven right, after failing miserably with their predictions on the DS, Wii, and 3DS. I mean, they are bound to be right about something eventually, but I don't want the Wii U to be a flop. What about a Bravely game on the Wii U? @Boukman: I agree. SE has been getting terrible with names lately. @eaglebob345 Yeah, I'd be pretty stoked if KH 1.5, 2.5, and 3 were released for Wii U. Been meaning to get into that franchise and would love to have them all in one place. Hahahha I'm more excited about this than Final Fantasy XV. Played the demo and it seemed like just another post-decline Squenix RPG to me. Is it just slow going, or something? @Barsteward1 That could just be your opinion. I bought the game when it first came out and I think its amazing. "Nintendo's portable appears to be the only system listed to date"
I thought this was confirmed a while back. 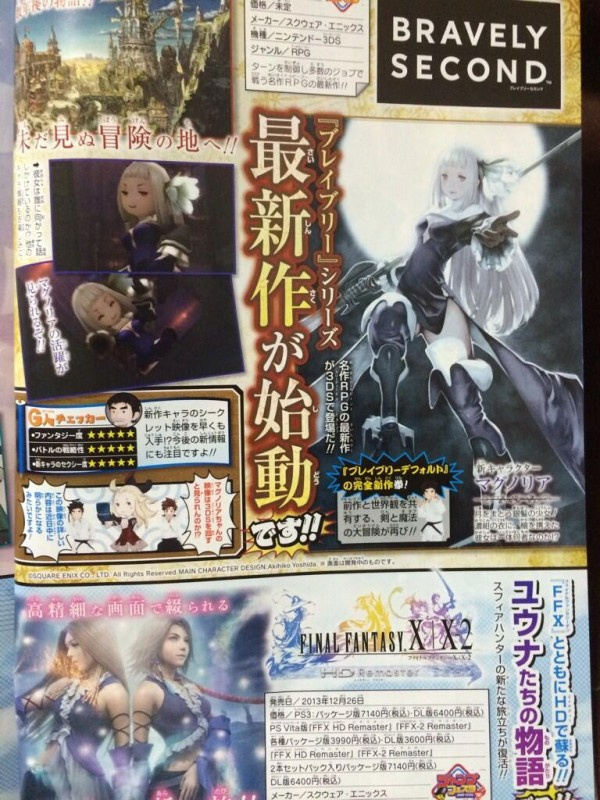 There is an updated version of the original called Bravely Default: For The Sequel that is being released before this. That version is the one that is being localized and released this week (or in the next couple of months depending on where you are). Great! Now say that you'll bring Kingdom Hearts 3 and at least one of the two HD Remakes of KingdomeHearts! Pretty please? It's kind of like the Tales games. Every time a new one releases in Japan, is right around the time we get the previous installment in the West. Please don't run this RPG into the ground, Square Enix. Please. @GamerGleek47 Good God, are people still on this? Wait didn't we just get the first one a week ago and now we're getting a sequel in Febuary 2014?? Wow, that's quick. Oh nevermind I didn't finish reading XD. Ignore my previous comment although if we had yet to get the first how come there was a review of it last week? @Peach64 As a Nintendo fan...why are you typing this? Nintendo fans should be the first people to understand in believing in the longevity of an IP. Ok, Sonic fans first (they can take a mean lose streak), but Nintendo right after. Hopefully I like it, so that I can also buy this sequel someday! Looks like I was wrong about the franchise jumping to mobile. A Bravely sequel already? But I haven't already play the first one yet. Wait a minute, isn't the stupid microtransaction rip-off thing in Bravely Default also called Bravely Second? Hopefully this won't turn into rip-off the game..